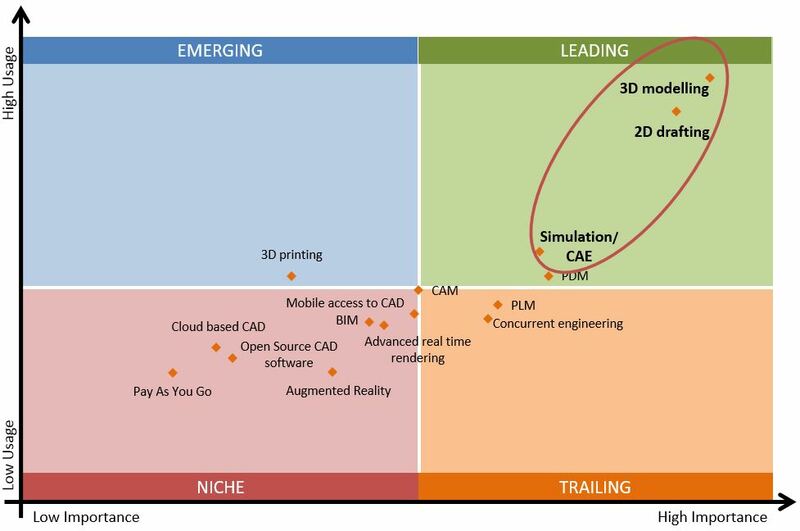 This post publishes more specific details on three of the top trends (3D Modelling, 2D Drafting and Simulation CAE (Computer Aided Engineering)) from the Worldwide CAD (Computer Aided Design) Trends 2016 Survey. Of all the CAD trends studied 3D Modelling, 2D Drafting and Simulation CAE are the most important and the most used. Users rate the Importance of these trends as 8.4, 8.1 and 6.8 (mean scores out of 10) respectively. Awareness of these trends is respectively 87%, 75% and 55% and current Usage is 76%, 68% and 34%. Importance, Awareness and Usage are high across all industry sectors, regions and size of companies. Future predicted growth potential is limited because the majority of relevant professionals are already using these capabilities but we’ll explore them individually below. However it’s notable that all these trends continue to grow including the use of 2D Drafting. 3D modelling is a core and slow growth area in today’s market. Usage is expected to grow from 76% last in 2015 to 79% this year and to 81% over the next 3-5 years. There is high current usage in manufacturing (81%) and other (85%) sectors (including government (79%) and education (100%)) and significantly lower usage in AEC (65%). There is also significantly lower current usage in APAC (60%) than in EMEA (79%) or the Americas (80%) but propensity for growth is not higher in APAC. Large companies are more likely to be current users (85%), although 7 in 10 use in small (70%) and medium companies (73%). The AEC sector is closing the 3D Modelling usage gap on the Manufacturing sector with predicted growth up to 4 times higher than Manufacturing, over the next year and 3-5 years. 2D Drafting is a core and stable area in today’s market. There are similar levels of current usage across industry sectors but significantly lower current usage in APAC (42%) than in EMEA (71%) or the Americas (77%). Usage is expected to grow slightly from 68% last year to 69% this year and to 70% over the next 3-5 years. Predicted growth is very limited in part due to high current usage, but also due to users shifting to 3D modelling. On average 39% of design work produces 2D drawings, 34% both 2D and 3D and 27% 3D. Three-quarters (77%) feel 2D drawings automatically generated from 3D CAD or BIM to be important to their business – and a similar proportion feel that the same or more effort should be put into improving 2D drafting capabilities by CAD software suppliers (based on those using or planning to use 2D drafting – 420). This demonstrates the continuing importance of 2D Drafting in a 3D CAD world. Some level of expert support for usage guidance is generally expected as part of the package (39% expect all support to be free, 28% expect some support to be free). 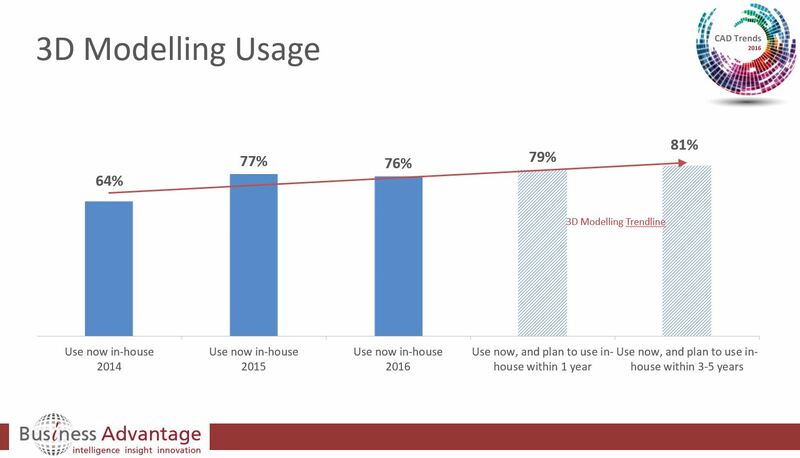 3D Modelling remains the most important trend in the CAD Trends Survey, but even in 5 years’ time 19% of CAD users don’t anticipate using it. Almost two fifths (39%) of design work produces 2D drawings, 34% both 2D and 3D and 27% 3D. This may be a testament to the longevity of 2D Drafting and point to the need for CAD software suppliers to continue to improve their 2D tools for a sizable portion of users who use both 2D Drafting and 3D Modelling or don’t plan to use 3D Modelling at all. For Simulation, even in 3-5 years, only about 43% of CAD users expect to be using it. If CAE Simulation vendors want to increase usage of these tools, improved ease of use, lower cost, flexible licensing and Cloud based access are key to greater growth. Comparing Manufacturing and AEC, even in 5 years’ time, Manufacturing leads AEC by a wide margin which may indicate that there is opportunity for more applicable simulation tools in the AEC space. Naturally the report is a high level summary of insights gained from the data gathered and this series of blog posts enables us to add further detail but if you are interested in still more detail, such as information on the 3D Modelling, 2D Drafting and Simulation CAE trends by region, industry or software vendor, give us a call to chat with a research executive about your needs. Thanks Dave, so pleased you found it helpful! This post publishes more specific details on three of the top trends (3D Modelling, 2D Drafting and Simulation CAE (Computer Aided Engineering))2D Drafting is a core and stable area in today’s market. There are similar levels of current usage across industry sectors but significantly lower current usagehis demonstrates the continuing importance of 2D Drafting in a 3D CAD world. 2D it’s easy to make but 3D it’s easy to see and understand, Great article. Thank you.